I am working hard in my studio making new pots and vessels for a number of upcoming shows for next month, so want to let you know where you can see my work in March here in MA and in Philadelphia, surrounding cities and online for NCECA. In my own fair state of Massachusetts, I will have my booth and be selling at the Paradise City Arts Festival juried craft show in Marlborough (3/19 – 21). On the instructional side, I begin a new six-week intermediate/advanced throwing class on 3/3, and I will be teaching a short workshop on marketing Saturday 3/27, both at the Worcester Center for Crafts, where I currently have work up in the Faculty exhibition. I will be attending NCECA (National Council on Education for the Ceramic Arts, 3/31 – 4/2) this year in Philadelphia since it’s a fairly short (5 1/2 hour) drive down and I am in a number of shows. I’m excited to also be attending the Pre-Conference Making Through Living—Living Through Making: Studio Pottery in 2010 hosted by Michael Connelly and Alleghany Meadows at a community college just out of town. They have a great line-up of potters to demonstrate as well as discussion panels. If you are attending NCECA (or live in Philly), I hope you will cruise by some of these exhibitions that include my work. I am honored to be in the Artaxis.org: An Evolving Independent Network of Artists exhibition (3/25 – 5/14 with an opening reception I hope to attend on 4/1) which was juried by members of ArtAxis (a peer juried site as well) and will be in the Gladys Wagner Gallery at the Cheltenham Art Center. 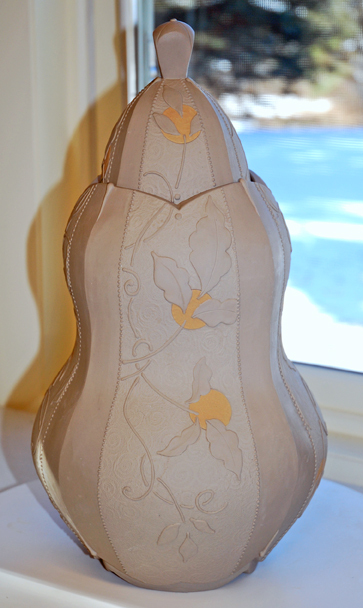 Pictured, Pear jar in progress. I am actually honored to be in all these shows, and the Studio Pottery show (3/30 – 4/2) with the Ferrin Gallery at the main conference hotel is no exception. I will have quite a few pieces for this exhibition (purchased pieces can be taken on the spot) which will be neighbor to Alleghany’s ArtStream. 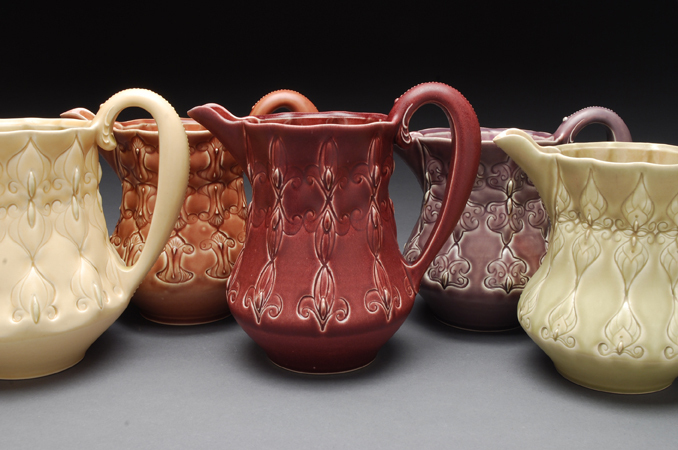 Also at the Philadelphia Marriott Downtown is the La Mesa exhibition (3/31 – 4/3) hosted by Santa Fe Clay. If you haven’t seen place settings by 150 invited potters, it is indeed something to behold! Also in Philly, but at the Marriot Courtyard Hotel, is the Strictly Functional—Then & Now exhibition with current work by potters who won awards in past Strictly Functional exhibitions (for me this was in 1997 by Val Cushing and 2000 by Ken Ferguson). 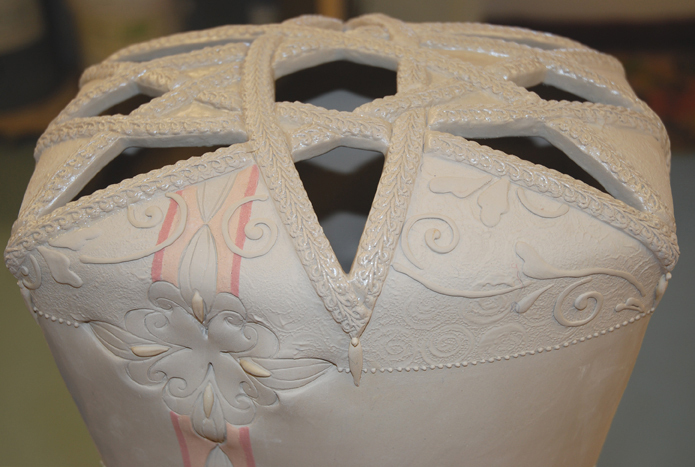 The Clay Studio will have some of my work too. 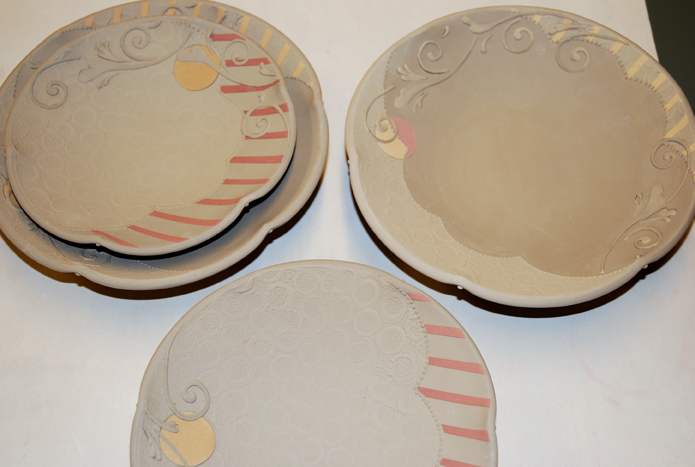 Pictured, stripe and dot plates in progress. Concurrent with the conference but in other cities, I will also have work in Celebrating Ten Years: 2000 – 2010 (3/25 – 3/29) at the m. t. burton gallery in Surf City, NJ; Made In Clay: Sustainable Sweets (3/25 – 4/29) exhibition at Greenwich House Pottery in NYC; Sumptuous Elegance (4/1 – 6/1) with the online Schaller Gallery, and the Yunomi Invitational (3/26 – July) at AKAR. Pictured, lattice work view of a tall flower brick in progress. More information about my upcoming exhibitions and workshops for 2010 is always on my Schedule page. Shwew! I need to get to my studio! Just finished watching your DVD and loved it!!! Now I know how you made the top part (sprig strips) of the third piece and will have to try that technique out for a border! Just finished viewing your DVD… I LOVE IT.. The DVD explained why some techniques I tried in the past did not work for me. I can’t wait until tomorrow to get into the shop and put my new knowledge to work. Thanks!!! !